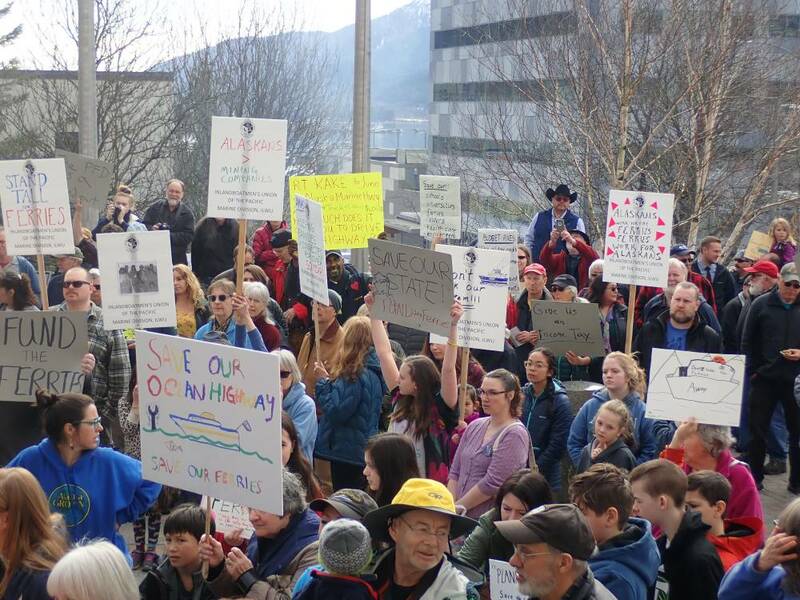 Hundreds rallied Wednesday on the Capitol steps in Juneau protesting the governor’s plan to shut down ferry service in October. This comes as the Dunleavy administration decided to offer more time — and a lot more money — for a new study to recommend ways to reduce or eliminate the state’s subsidy for the Alaska Marine Highway System. “3,500 miles of coast serving 30 communities for almost 70 years and this governor thinks — we don’t need it,” Rep. Sara Hannan (D-Juneau) told the rally amid boos to the governor’s proposed austerity budget. It was a colorful rally with several hundred people. They came from coastal villages and labor unions whose members work for the ferry system. A small group broke out into a traditional Tlingit canoe song. “A lot of people refer to the marine highway boats as ‘blue canoes’ so it just really fits,” explained singer Nancy Keen of Juneau. “Save the blue canoe!” another cried. The Alaska Marine Highway System serves a dozen communities that have no barges or scheduled jets. Communities like Angoon. That’s where Joyce Frank and her husband, Kevin, are from. “There’s no barge, there’s no landing strip and it’s a big issue for Angoon,” Kevin Frank, Sr. said. “If you take the ferry away, we absolutely have nothing at all,” added his wife Joyce Frank. She was among the more than 200 people that testified to a House committee urging the legislature to reverse the governor’s cuts. Sen. Jesse Kiehl (D-Juneau) told the rally a ferry shutdown would be unthinkable. Republican Gov. Mike Dunleavy had campaigned on reducing state spending. Eliminating ferry service wasn’t part of his pitch. But now a 75 percent cut to the ferry budget is touted as a way of helping balance the budget without raising taxes, revising oil tax credits or touching Permanent Fund Dividend checks. Cutting the ferry budget was only one prong of the administration’s approach. The other was to pay a private consultant up to $90,000 to study privatization and other options. That report would have been due July 31. But Alaska Department of Transportation’s regional spokeswoman Aurah Landau said there was little interest. “DOT received one response to the original RFP and we had heard from interested parties that a longer time frame and a larger budget was needed in order to provide for a more in-depth study,” she said. This week the state revised its request to expand the scope of work — and the budget. Now it’s offering up to $250,000 for a study due in mid-October. That’s two weeks past the Dunleavy administration’s self-imposed Oct. 1 shutdown. But Landau says the timeline hasn’t changed. “The governor’s budget is proposing that it would shut down in October and that’s the proposal that’s on the table right now,” Landau said. New proposals are due April 2. An award would be announced on April 9. Advocates of ferry reform have been working for years to un-tether the ferry system from state politics and make the system more efficient. The most recent effort was spearheaded by Southeast Conference, which released its latest study in 2017. Many Southeast residents are frustrated. The Peterburg small business owner is active with the Alaska Marine Highway Reform Project. He says ferry privatization isn’t realistic or it would’ve happened long ago. The state’s revised request for proposals asks prospective consultants to incorporate previous studies including the reform committee’s work. Kensinger says that makes sense. But he questions whether $250,000 could be better spent elsewhere in the system. Meanwhile, the House and Senate finance committees are reviewing the transportation budget. That’s where legislators will have a hand in salvaging or scuttling Alaska’s ferry system. And Gov. Mike Dunleavy plans to hold meetings around the state to drum up support for his budget. There are no stops scheduled in Southeast Alaska.